Seeing a straight smile is something many patients long for when they look in the mirror. Despite this, the idea of having long-term metal braces wired to their teeth makes the process less than appealing. With the advancements in orthodontic technology, there is no need to forgo a fabulous set of teeth anymore. The revolutionary Invisalign® clear braces will create a stellar smile in a more manageable and far faster timeframe. Dr. Lockhart, located in Indianapolis, IN can consult with you about the process of using Invisalign® clear braces to straighten your teeth, and if you do choose to try this orthodontic product, you are sure to be dazzled by the entire experience. Great for mature teens and adults alike, clear is clearly the way to go! Instead of using those old-fashioned braces with cumbersome metal brackets and wires to straighten teeth, Invisalign® provides a more modern solution that is barely noticeable, since the “braces” are actually clear trays that fit right over the teeth. Even without the traditional “hardware,” these clear alternatives still get teeth remarkably straighter and they also correct spacing issues. Additionally, these clear aligners are helpful in improving the appearance of crowded teeth, and they correct overbite, underbite, crossbite, and open bite too. Some patients only need them for their top set of teeth, some for the bottom set, and others have them for both the top and bottom. They slip right over the teeth and fit comfortably because you will have a 3-D image taken of your teeth and your customized Invisalign tray(s) will be designed at the lab. What many people love most about Invisalign® is that their straighter smile arrives 50% faster than with traditional metal braces. Fast and free of that “metal mouth” appearance? What could be better? Yes, you can (and must) remove them while you eat, and brush and floss your teeth. Otherwise, keep them in place at all other times, as much as possible. You will enjoy the fact that the Invisalign® trays are quite flexible, making them comfortable while you speak, smile, and even sleep. They won’t irritate your gums either. Can I eat normally while using Invisalign®? Since you will remove the trays while eating, you can eat as usual. Just be sure your teeth are free of debris or food particles before replacing the tray back over your teeth. How long will I need to wear my Invisalign® clear braces? While you may see some initial results in just a few weeks time, it will take an average of 12-18 months for full and final results. This is still far faster than results from traditional metal braces. How will the process go? At your initial appointment, we will take an accurate impression of your teeth and bite and send it to the Invisalign® labs. They will soon send back a “before and after” expectation image of how your smile will appear after you use the Invisalign® trays for the proper amount of time. Then the Invisalign® trays will be custom crafted and sent to our offices within about two weeks. You will come back to get them and be instructed on how to use them properly. If for some reason they do not fit well, we will get them readjusted. For the best results, we will direct you to wear your Invisalign® clear aligners for 22 hours each day. 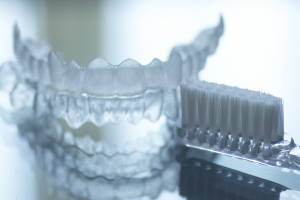 Will wearing the Invisalign® trays cause discoloration? Unlike traditional metal braces, Invisalign® won’t discolor your teeth beneath. In fact, you can even whiten your teeth while wearing the aligner using strips, gels, or in an in-office whitening system. Invisalign® is an incredible option that has improved the smiles and self-confidence of so many of our patients. The results are fast and the process is painless. For those who have longed for straighter teeth but never did anything about it because they did not want to wear metal braces, Invisalign® is the answer they’ve been waiting for. Going out in public with clear braces is much more appealing, especially for adults who want to improve their smile. The idea of wearing metal braces reminds them of those “awkward” teen years. And who wants to face that again? And even people who have worn braces in the past may have experienced significant shifting over the years. There is always a second chance to get things straight once again. What are you waiting for? Your smile can be straighter and more suitable for your mouth. Many issues can be easily corrected and in a far faster time frame than metal braces. It’s your time to smile with clear confidence! Do you want to learn more about Invisalign and if they are the right choice for you? Call the office in Indianapolis to set up a consultation: 317-449-8048 and Dr. Lockhart will give you all the details. Your “before and after” will be a dental dream come true.